The C Rangarajan committee to review prices of petroleum products says that the government should increase the price of liquefied petroleum gas (lpg) cylinders by Rs 75. This is essential for oil companies, which are burdened by financial losses because they sell gas below the cost of production and distribution, says the committee. It also sees no merit in subsidising lpg , which it says is predominantly the cooking fuel of the middle classes and not the poor. The ball is now in the government's court, which is possibly worried about the impact of a hike on the forthcoming state elections as much as it is worried about the oil companies' bottom-line. But why am I writing this now? The fact is that we talk about subsidies in rather simplistic economic terms, as good or bad expenditure by government to provide for needs which are not affordable to the poor. The answer then is to reduce subsidy as the poor become richer and to pass on the burden through user charges paying for the cost of producing electricity, supplying water and of course, in this case, providing fuel to cook food. If pushed further, the same economists will tell you that for purposes of social justice, the subsidies can continue but in a targeted manner (meaning subsidies will only go to those it is meant to reach: the poor). Therefore, the assumption is that subsidies are for the poor and that the rich must and can pay full costs of the resource. The point, however, is that in India, most subsidies are not for the poor but for the rich. The fact also is that the reason we have to remove subsidies is because the state cannot bear the expenditure of larger numbers of people. In other words, it cannot afford that larger number of Indians become richer and users of subsidised goods, which are the privilege of some. It is also assumed that Indians once they become rich (or richer) can pay for the same subsidised goods at full cost. We do not question the fact that given current levels of technology or methods of production, even the middle-rich (not the richest) will not be able to afford a number of things at full cost. And that what is really needed is not to reduce subsidy per se, but to seriously rethink technology so that these things can be provided not just for some but for all. Take the case of lpg. This fuel has been traditionally subsidised, even though it has been the cooking energy of the more affluent. It was subsidised because it was accepted that this fuel is now convenient, less polluting and more efficient and, therefore, should be promoted as the preferred way of cooking. It was promoted even though it was clear that the rich, for whom it was being marketed, could not afford it, hence the subsidy. But over time, given the lack of alternatives available and its obvious benefits, lpg has become the fuel, not just of the rich but also of the lower middle classes. The March 2005 National Sample Survey (59th round) on household consumer expenditure reported that the most striking change was in the proportion of households using lpg as a fuel. 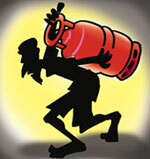 Now over 55 per cent of urban households use lpg as against 44 per cent in 1999-2000. The reach in rural India was still minuscule but had doubled during this period to reach roughly 9 per cent. In other words, the state now has to subsidise larger numbers of people, who have become users of this gas for cooking. The question is, are people rich enough to pay the price of lpg without the subsidy? Currently, the price of an lpg cylinder is roughly Rs 300 and it is widely reported that the oil companies need another Rs 150 to cover costs of production and distribution. The average use of gas is roughly one cylinder each month by a household, but richer families use more gas and therefore, more subsidy. But this is not to say that the poorer households are not using gas. The earlier 55th round of the National Sample Survey reveals that fuel penetration is growing fastest in lower middle class urban households, where use is growing but purchasing power is not. Then there is the issue of rural households, where the subsidy has still not even reached. The Andhra Pradesh government launched a programme called Deepam in 1999 to provide one-time capital costs of the cylinder and regulator to households below the poverty line. But it was soon found that they did not have the money to pay for the recurring costs of the gas cylinder and even within the relatively richer households firewood remained the main cooking fuel. In this scenario what are the options? The current subsidy is inadequate to meet the fuel needs of vast numbers of people, but it is too high to be sustained by oil companies. The fact is that food cannot be cooked without energy. But the tragedy is that we have never really considered 'alternatives' to lpg, which we continue to promote, even if we cannot afford it. But because we were in the business of subsidising a few, the issue was never urgent. But what do we do when the subsidy burden cannot be shared? The answer is to reduce costs so that more people can afford to pay. The answer then is to rework our technological options from thinking of advanced biogas in rural India for cooking fuel to cost-effective local solutions in urban India, like generating gas from municipal waste and many other options. The fact is that we do not need 'alternative technologies' only for the poor, but also for the rich. Otherwise, Indian-style socialism will continue to mean that the rich are subsidised in the name of the poor.